The life of man in these days has become very busy. In this working lifetime, the primary domestic works seem very tight for him. So, to make his domestic life easier, many advanced electronic devices like Washing machines, fridges, etc., are available in the market. Top Washing Machines make the work of washing the clothes to have a cake walk. Among all the manufacturers of washing machines, Haier ranks better than most of the other brands. Here in this article, we provide the list of best Haier Washing Machines and their types. Hope it will be useful. The company of Haier manufactures washing machine with the best features and available under your affordable prices. Haier washing machines have a good sale same as the other top manufacturers. From the variety of models from Haier, choose the best ones as per your requirement. How to choose the best Haier washing machines? How to maintain Haier washing machines? 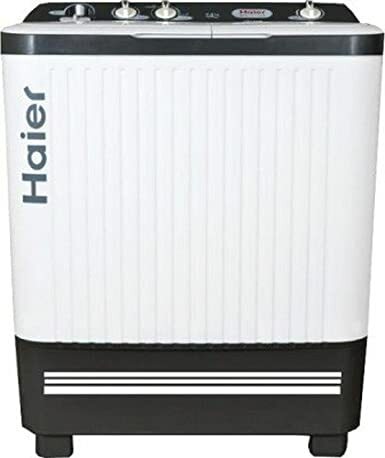 Here this article provides information regarding the Haier washing machines models, prices, the rating of the goods and features. The name Haier washing machine NZP from its working type of NZP technology – it can work upto .001 mpa water pressure. So the device will not stop working when there is low pressure. The Haier HWM70-9288NZP has a feature of auto restart. Wash capacity of this Haier washing machine is 7kg. There are 8 wash programs to complete the washing process. The operating voltage of the machine is 240 volts. This is the top most Haier washing machines available. The Haier company offers 2 years of free service for this device. Works at low pressure also. The Haier HWM70-9288NZP fully automatic top loading washing machine has a warranty of 2 Years. The Haier fully automatic washing machine HWM 60-10 has an advanced feature of displaying the status of each and every process of wash. The display type is LED display. The top loading Haier HWM 60-10 has the additional feature of foam detection in water. For this purpose, a foam detecting sensor is used on this machine. The option of quick wash is available which ensures you to wash the clothes quickly. It also displays the remaining time left to complete the cleaning process. By this, you’ll be free from the attention towards the machine and mind other works. The wash capacity of this Haier washing machine is 6kg. The drum rotates at a rate of 1000 rotations per minute. This Haier HWM 60-10 model has 3 years of warranty on the motor. The Haier company offers a warranty of 3 Years on motor and 1 Year comprehensive. Haier HWM 60-10 fully automatic top loading washing machine. The Haier fully automatic washing machine is with an outer plastic cabinet. So, the device can be placed in wet areas too. It is movable from one location to another. Multi segment display is available which updates the user about the washing status. Quadra flow pulsator generates multi-directional turbulence in the drum and rotates your laundry forcefully. The forceful rotation of laundry helps in a multiway rotation for a better wash. The Haier HWM58-020 fully automatic top loading washing machine has a warranty of 2 Years on the product and 5 Years on motor. This Haier semi-automatic washing machine is rust free. It can be placed even in wet areas. So, the life of washing machine is longer. The top loading semi-automatic washing machine is a bubble wash device. Here, the bubbles from the bottom of the tub hit the stains on the clothes and remove the dirt from the Hence we obtain brighter and cleaner clothes. You can move the machine from one place to another quickly. There is an option of Start-Stop-Pause, where the process of washing can be controlled. The motor runs at a speed of 800 rotations per minute. The number of clothes that can be washed at a time is 6 pairs of trousers. The washing process is completed in a total of 3 wash programs. 5 years of warranty is offered on this Haier XPB62-0613AQ washing machine. The Haier XPB62-0613AQ semi-automatic top loading washing machine has 5 Years of warranty period. Haier semi -automatic washing machine is a rust free device. It can be placed even in wet areas and can be moved anywhere easily.The XPB72-713S model is a bubble wash type. Hence, bubble from the bottom of the tub hits the stains on the clothes and removes them. The roll goes till 15-degree celsius. The washing process can be controlled by the option of Start/Stop/Pause . A certain period of time can be set for the wash program according to your willingness. The rate of spin of the drum is 740 RPM. This Haier semi-automatic washing machine completes one wash process in a total of 3 wash programs. The warranty offered by the Haier company on this product is 2 years on the machine and 3 years on motor. The Haier XPB72-713S semi -automatic top loading washing machine has 3Years of warranty on motor from the Haier company. These Haier washing machines are rust free devices. They are movable anywhere in the home. This device is portable and is easy to move from place to place. The installation is a free standing type. Plug and play type installation is required here. The Haier HTW80-185VA has a wash capacity of 7.8 kg, where 7 pairs of dresses can be washed at once. This is suitable for big families. The total wash process is completed in 3 wash programs. Since this is a top loader type, this is a lightweight washing machine. So, this is easy to move wherever necessary. The warranty offered by the company on this Haier semi-automatic washing machine is 2 years. The Haier company provides a warranty of 2Years on this Haier HTW80-185VA semi-automatic top loading washing machine. This Haier HW70-1279 front loader is of 7kg wash capacity. Hence it is free from the overloading problem. Big families can opt for this type of device. It has Class A+++ higher energy ratings which show the energy saving feature of this machine. Bacterial growth is less with the Abt Haier’s antibacterial treatment. The specific program helps you to have a wash program in the set record time. Auto restart feature is available in this washing machine. So, whenever there is a power failure wash process restarts from the previous position. The wash capacity of this HW70-1279 model is 7 kg. One wash cycle completes in a total of 11 wash programs. The spin rate of the wash drum is 1200 RPM. 5 years of warranty is offered by the company on this Haier washing machine. Specially designed for delicate fabrics. AMT gasket and higher energy rating. The Haier fully automatic washing machine HSW72-588A Has a lot of features. It can wash all kinds of fabrics like cotton, wool, silk, jeans, sportswear. The time of the roll is controllable in three modes like the quick wash, prewash. The voltage/frequency acceptable is 220V/50Hz. Input power required for the machine to operate is 420W. This device has an additional feature of memory function. The settings that are once set remains unchanged until you change. The same settings work for the next wash also. The wash capacity of this fully automatic washing machine is 7.2kg. One wash cycle is completed in 8 wash programs. The HSW72-588A fully automatic top loading Haier washing machines have 8Years of warranty on motor from Haier company. The Haier HW55-1010 model has a unique feature of washing your clothes faster. So, when there is any urgent work, laundry can be washed in very much less time. It is rated 5-star energy efficiency. Special features of child lock, timer, and nine wash programs are present. Individual sensors are fixed in the machine to sense the presence of foam. Overheating of the motor is a sign of the damaging of the machine. There is a special feature of protecting the engine from getting heated. 5 pairs of trousers can be washed at a time in one wash cycle. The number of wash programs for one washing cycle is 9. The Haier company offers a warranty of 5 years. The Haier company provides 5Years warranty on this HW55-1010 fully automatic front loading washing machine. These Haier washing machines have a long life when there is no overload of clothes. The device does not work during overload. High efficient motor helps in great rotation of clothes. The faster rotation helps in high durability and efficiency to take the overload. The machine has a plastic cabinet. So, the device can be installed in wet areas also. The wash capacity of this Haier XPB76-113S is 7.6kg. The drum rotates at a speed of 740 RPM for the washing purpose. The outer cabinet of the machine is plastic. So, this is a rust free device. The Haier company offers a warranty of 5 years on this Haier semi-automatic washing machine. Some washing machines are available in the market today. Before buying a product, one should be aware of the various types and their features. Based on that knowledge and your requirement, you should select the device. This article helps you in finding the best washing machines that satisfy your needs. The list of features that you need to consider while choosing the best washing machine is given below. The fully automatic machines are the one which operates automatically. Once the clothes are placed in the drum, washing and drying process is done automatically by the machine itself. The fully automatic machines are more preferred because of the presence of more features. You can add clothes in the middle of the wash process. The fully automatic washing machines are available in wider ranges. Fully automatic washing machines are of two types. They are Top loading and Front loading. Top loading is much less weight than a front-loading washing machine. But the saving of natural resources like water is possible in front loading. Top loading washing machines have user-friendly features and simple to use. Front loaders are very gentle at washing the delicate fabrics. So, this is the best choice for light and soft textiles. Top loaders work faster than front loaders. The addition of clothes in the middle of the process is possible in the top loader, which is not available in front loaders. The Haier semi-automatic washing machines work smoother and with less noise. Use a good detergent or wash powder in the washer. The fabrics are stain free and clean with the best cleaner or solvent. Digital display for semi-automatic washing machines is not available. The preference of semi-automatic washing machines is high because of its price. When compared to Fully Automatic Washing Machines, the Semi Automatic Washing Machines are available with less price. Haier semi-automatic washing machines are preferable for small families and bachelors. The quantity of fabric is less for small familiesTop Loading vs. front loading. Everyone cannot invest much money in appliances like washing machines, etc. Different people have different incomes. So, when you decide to buy a washing machine, check out on the devices with the price that you can afford. Haier washing machines have different ranges of prices on the washing machines. You can choose the device according to your requirements. When there is a power failure, the device turns off. When the power is ON after some time, the device settings need not be reset again. The machine starts again from the previous cycle. The steps in completing the washing of the clothes come under wash programs. The wash programs are beginning, a rest period, a rinse, and then a spin to dry the clothes. Different Washing machines have a different number of wash programs. Front loading is better than the top loading. Front loader is expensive and can wash the clothes cleaner than the top loader. If the place of installing the device is small, then choose top loading. If the area is large, then opt for the front loader. The clothes are washed with the spin speed. The rate of the spin determines the speed of the washing process of the washing machine. The spin rate determines the best washing machine. Wash capacity is simply the size of the drum. If the size of the drum is large, more clothes can be washed. For example, 1kg weight is equal to one pair of dress. 5 kg weight is equal to 5 pairs of dresses. The company offers free services during the warranty period. The warranty period may be two years, five years, and so on. Warranty period is different for different products. The Haier company provides customer service very effectively. You can clarify your doubts regarding the product by calling the customer care number. The client care number of Haier is 1800 102 9999. Plug in the Haier washing machines to the power socket. Put clothes and the detergent in the respective places. Set the wash programs and timer. Take the clothes out after wash process is completed. To have a longer life and practical working of the Haier washing machine, it should be maintained well. Regular attention is needed to have effective working. These are some of the steps of maintenance. Clean the drum after washing is completed. Do not overload the Haier washing machines. Keep opening the door for some time to remove the residual moisture. Use the proper amount of detergent. Check the washer basket is aligned correctly or not. Ensure the washing is draining properly. Test the hose for cracks or damage. Check whether the machine is overloaded. Loud noise occurs when shock absorbers are damaged. Make sure that the machine is not overloaded. Find the solution in the user manual. See that the washer basket is installed correctly or not. Haier group is a Chinese multinational consumer electronics and home appliances company. The headquarters is located in Qingdao, China. Consequently, the team started its operations in India in January 2004. The Haier India Pvt. Ltd Headquarters is based in Delhi. In 2015, it had 33 service sites including Bombay, Chennai, and Calcutta. It is placed in the Top 20 trusted brands in India by The Brand Trust Report, conducted by Trust Research Advisory.